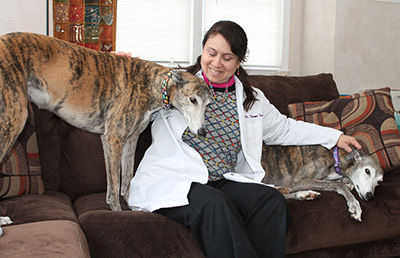 Veterinarian Sharon Sernik, shown at home with her own two greyhounds, runs Journey’s End in Merrimack. She offers clients at-home euthanasia for pets, a gentler, more personal procedure. People adore their companion animals, so much so that they return their dog’s or cat’s affection with anthropomorphic acts, such as dressing them up for Halloween or buying them birthday gifts. Nearly half of dog owners share their beds with them, and plenty take them on vacations, groom them at spas and pay high fees for doggie day care. As pets age, owners want the same level of compassion for their four-legged friends they seek for their human loved ones. And that’s fueling a growing industry around pet hospice services — a movement that closely mirrors the trajectory of human hospice. When Karyn Burritt’s 20 year-old cat Sadie developed severe asthma at the end of last year, her first concern was to find the right treatments to make the feline tortoiseshell comfortable for as long as possible. Meanwhile, the prognosis was grim. “I didn’t know how much the pain drugs or any other meds were going to cost because we didn’t get that far,” says Burritt, who lives on a three-acre lot in rural Temple with her husband and two other cats, two guinea pigs and a horse. Expenses never factor into her decisions on how to treat her animals, she says. Burritt’s refusal to cap a price on the value of an animal’s life is not uncommon. According to the American Pet Products Association, consumers in 2014 spent more than $58 billion on pet products and services. Around $15 billion of that is on veterinary care, a spike of 6 percent in that category from the previous year. And because more people are choosing technologically advanced procedures to extend the life of their pets, the veterinary care segment is expected to grow another 4.6 percent to over $15.7 billion in 2015. Aggressive treatments complicate the wrenching choices around euthanizing, shelling out vast sums for state-of-the-art CAT scans or simply waiting it out, causing guilt and stress for many pet owners, especially those with restricted incomes. Unfortunately, veterinary care is rarely a low-budget item. Even a routine dental surgery runs as high as $1,000; a bone marrow transplant costs upwards of $15,000. “People will say and do things for their animals that when I graduated from vet school in 1981 they wouldn’t even consider,” says Allen Wachter, a veterinarian at Stonecliff Animal Hospital, who has practiced in New Hampshire for the last two of his 33 years. The goal of hospice and palliative care for pets, says Amir Shanan, founder of the International Association of Animal Hospice and Palliative Care (IAAHPC) and director of Compassionate Veterinary Hospice in Chicago, isn’t about promoting such high-end treatments as chemotherapy or transplants. Shanan says good hospice care relies on a team of specialists, including non-medical personnel such as social workers and massage therapists, to monitor the emotional and physical well-being of the animal and its family. In February, Wachter opened a new location in Lebanon that focuses on providing geriatric care. He agrees with Shanan’s team approach. The veterinarian, who also holds a doctorate in ministry, says he saw an unmet need in the Upper Valley for in-home euthanasia and complementary treatments that give aging pets a good quality of life. He coordinates with other specialists in chiropractic, physical therapy and acupuncture, and employs opioids and feeding tubes, all of which he says weren’t available five years ago. Another New Hampshire veterinarian with a sought-after niche is Sharon Sernik of Journey’s End in Merrimack. Whether or not the 21st century is a more compassionate era for pets is up for debate. That wealth is playing a role in other sectors of the pet hospice industry. Mark Robinson is president of the online site handicappedpets.com. Based in Amherst, it has 23 full-time employees. The privately owned company sells wheelchairs ranging from $250 to $500, as well as diapers, splints, boots and other products for older, handicapped and injured pets. Robinson won’t disclose revenues, but he does say the company has been growing about 20 percent a year since 2008, a pace he attributes in part to new technologies and the growing acceptance of hospice and palliative care. Sernik gets referrals through word of mouth when clients seek in-home euthanasia for a gentler procedure than what occurs in a clinic. As to not compete with other practices, this is the only service Sernick provides, in addition to a compassionate ear. When Sadie’s breathing deteriorated in January, Karyn Burritt called Sernick, who traveled to her home on a Sunday afternoon. Together, they sat on Burritt’s bed where Sadie usually spent the night. Now in her mid-40s, Burritt is a veterinary candidate at the Cummings School at Tufts University. Previously, she had been a veterinary technician and saw many a euthanasia procedure go awry, with the animal thrashing uncontrollably before succumbing to death. Within a few hours, the abandoned cat with the glowing green eyes Burritt had found in a hay bin in a horse stable a dozen years earlier was laid to rest. “I’ve never experienced that type of peaceful, positive passing,” she says. Costs for at-home euthanasia run about $100 higher than area clinics, which charge anywhere from $125 to $250. The fees can also vary because of travel time and what types of mementos, such as clay paw prints, owners want as keepsakes. Pet owners want the same type of supports any family member would receive through human hospice, she explains. Despite these changing attitudes, Shanan of the IAAHPC says the movement carries a stigma for prolonging life to satisfy a pet owner’s emotional needs at the cost of the animal’s suffering. Goldberg lectures at Cornell and is pushing for more end-of-life care training in college curricula. Along with the IAAHPC, her organization also supports steps to develop a board-certified specialty in hospice and palliative care that the American Veterinary Medical will recognize. Family veterinarians treat all the life cycles, she points out, but most can’t administer to small animals in their homes. “Yesterday I saw a patient for three hours,” she says. “Most vets wouldn’t have that chunk of time.” And most aren’t comfortable discussing euthanasia. To be fair, it’s a difficult subject. The mendacious “runaway dog” saga Charles Gaudet of Greenville understood as a child was not one he wanted to bestow upon his own three young children, all under the age of eight, when his Bernese mountain dog Monet was diagnosed with a muscle disease that restricted her movements. For emotional support, Gaudet and his wife contacted Katharina Brandt, a mobile vet who specializes in hospice and geriatric care. Notwithstanding the sophistication of the high-tech medi-van she travels in, the style in which Brandt operates is reminiscent of the old-school country vet who spends the day visiting one or two farms and its animals. Brandt, of Seacoast Veterinary Housecalls, says she likes to see the pets in their own environments so she can give tips on managing safety and suffering. The popularity of hospice vets like Brandt is a rising acknowledgement of the pet’s significance throughout a family’s milestones and struggles, and the grief that reverberates after the loss of that pet. As Gaudet’s dog began to stagger because of her illness, Brandt coached the parents on how to introduce the concept of death. When the 90-pound Monet fell down, the three young children helped to pick the dog up. They saw her struggle, and because they were involved in her care, the kids weren’t in shock, and in fact participated in the decision to euthanize. And they found ways to memorialize her; for example, after her passing they took her collar and put it on a little stuffed animal that looks like her. “She [Dr. Brandt] turned what could have turned a traumatic experience – and this may sound bizarre – into a blessing,” says Gaudet.